We produce both engineered hardwood flooring and solid hardwood flooring for most of our customers - so we're not biased. For most home applications, however, engineered hardwoods such as Southern Traditions are a better choice than solid hardwoods. 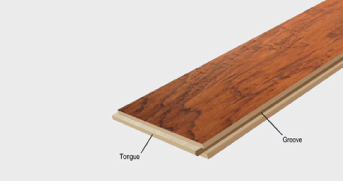 Engineered hardwoods look exactly the same as solid wood. But there are important differences. 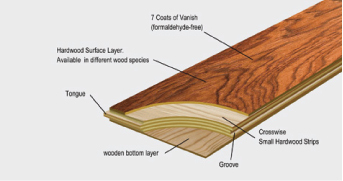 Engineered flooring is composed of multiple cross-stacked layers. This makes it impervious to humidity and moisture, unlike a strip of solid wood. It also allows for the use of longer planks--providing not only a more desirable look, but also resistance to bending or bowing, as can happen with longer solid planks. Solid planks can also suffer from expansion and contraction in changing seasons, leaving unsightly gaps, as well as "cupping" from moisture and shrinkage over a long period of time. Engineered flooring is more flexible in application as well. It can be directly glued down on a concrete slab, or stapled to a wood sub-floor. And, it can be installed on any grade level. As a result, engineered floors are well suited to almost every room in the house, including kitchens and dry basements, and offer superior durability in addition to uncompromised beauty.